Canton, 7 vs. Attleboro, 6 – Final (8 inn.) – Click here for a photo gallery from this game – Attleboro scored twice in the top half of the seventh inning to take the lead but Canton tied it in the bottom half to force extra innings then walked off with the win in the bottom of the eighth. Mike Konzal (2-for-4, run) drew a two-out walk, advanced to second on a single from Steve Burbank (2-for-4, run, RBI), and then scored the game-winning run on a hit from Matt Pigeon (3-for-4, two runs, two RBI) for the winning run. Pigeon was the catalyst for the tying run in the bottom as the seventh as well. Trailing 6-5, Pigeon led off with a double, advanced to third on a fly out from Matt Connolly (double, RBI), and scored the tying run on a two-out double from Rob Sullivan (2-for-3, two RBI). Each team scored in the first inning but Attleboro seized a 4-1 advantage with a run in the second and two more in the third. Troy Gamache drove in Tim Callahan (3-for-4, two runs) to put Attleboro up 1-0 but Canton responded in the bottom half as Pigeon brought Nate Quan (2-for-4, two runs) home with a sacrifice fly. Attleboro’s Bailey Camacho put the Bombardiers back in front, 2-1, with a sacrifice fly that plated Sam Larkin (double, two runs) in the second inning. Attleboro extended the advantage to 4-1 when Alvaro Espinal tripled and scored on a wild pitch, and Larkin doubled and came home on an error by the Bulldogs. Canton scored once in the fourth (Rob Sullivan RBI double) to make it a two-run game before putting three on the scoreboard in the fifth to take the lead. Quan, Konzal, and Burbank each singled, the last hit bringing Quan to the plate for a run but Larkin gunned down a potential second run on the play. Canton’s offense continued to battle though, with Pigeon singling to put runners on the corners. A double from Connolly tied the game at 4-4, and an RBI single from Paul Corcoran put Canton up 5-4. In the top of the seventh, Mason Houle (2-for-4, run, RBI) drove in Callahan with a base hit and scored the go-ahead run on a wild pitch. Senior Kevin McGonigle earned the win in relief, tossing two scoreless innings without allowing a hit and striking out one. Franklin, 5 vs. Milford, 4 – Final – Click here for a photo gallery from this game – Franklin trailed 4-1 heading into the fifth inning but scored two runs in the fifth and two more in the top of the seventh to pull out a come from behind victory over neighboring Milford at the Taunton High turf. Alex Haba drove in a pair of runs, including the game-tying run, and scored the eventual game-winner in the seventh, coming home on a sacrifice fly off the bat of JB Floris. Milford jumped out to a 1-0 lead in the bottom of the first. Nick Marcolini started the inning by getting hit by a pitch, moved into scoring position on a Matt Shaver single. Colby Pires, who also started for the Hawks and struck out four in 4-1/3 innings, plated the opening run with a single to left. Franklin tied the game in the top of the fourth. Haba walked, stole second, and scored on a single to right by Cooper Ross. The Hawks responded in the bottom half with three runs off the Panthers starter Liam Dailey. Danny Corsini started the rally with an infield single and moved to second on a wild pitch before scoring on a Nick Wimette single. Carter Scudo doubled to left to put two in scoring position. Luke Rosa looped a basehit to right to score one and then, after a pitching change, a balk brought in the fourth run. In the fifth, the Panthers struck for two. Joe Lizotte walked and Jack Nally got hit by a pitch. Scott Elliott loaded the bases with an infield single. A Haba sac fly made it 4-2 and Jake Macchi singled in another to make it 4-3. In the seventh, Elliott walked and stole second before coming around on a Haba single to center to tie the game. With Haba at third, Floris hit a fly ball to left that was deep enough to get in the winning run. Jake Fitzgibbons closed out the game, earning the win with four innings of scoreless relief. 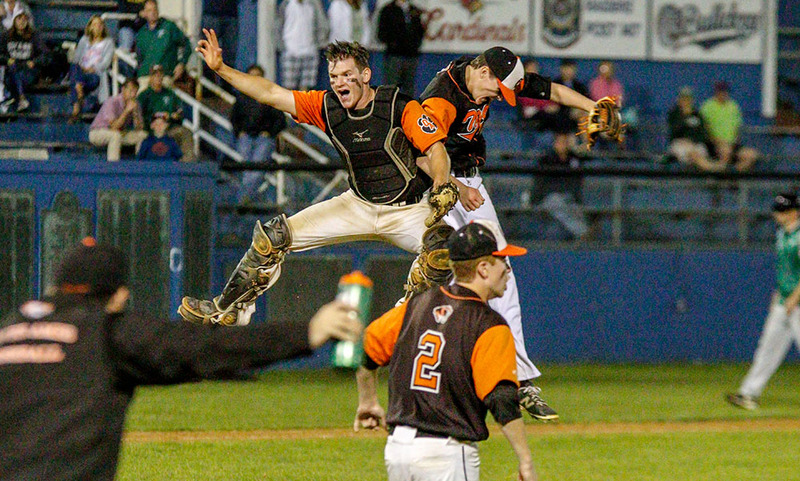 Oliver Ames, 5 vs. Stoughton, 11 – Final – Click here for a photo gallery from this game – Stoughton scored in each of the first four innings, jumping out to an 11-3 lead and never looking back to get a win over Oliver Ames. Cian Swierzewski, James Genest, and Mike Nazzaro each scored in the first inning to help the Black Knights jump ahead. After Oliver Ames got on the board in the top of the second (Jake Erlich leadoff double, scored on infield single from Jared Spillane), the Black Knights cashed in on a pair of OA errors and walks to make it 4-1. Chris Pearsons (4-for-4, two RBI, two runs) had an RBI triple and scored on an error in the top of the third to make it a one run game at 4-3, but Stoughton tacked on three runs in the bottom half to regain a multi-run lead. Three walks loaded the bases for the Knights in the bottom of the third. Stoughton scored on a passed ball, a wild pitch, and an RBI single from Cam Dirosa to make it 7-3. Stoughton pushed across four more runs in the bottom of the fourth inning. Jacob Kaplan walked, stole second, and came home to score on an infield error that was put in play by Clayton Rahaman. An RBI double from sophomore Brady Conlin made it 9-3. Swerziewski then connected on the first home run of the season for any Hock player, and first high school player to hit a home run at the new Taunton field, with a two-run blast to make it 11-3. Oliver Ames scored single runs in the fifth (Jacob Levine RBI double) and the seventh inning (Pearsons RBI double).